After a few false starts on the fourth? attempt I finally completed the Moonlight Southern Crossing. Prior attempts having been thwarted by weather and well, a sheer lack of Moonlight. Weather plays a major part in Tararua affairs, mist normally covering the tops for 250 days of the year. Southerlies bring the snow and freeze them; westerlies bring the rain and wet them; and the northerlies blow until it is a marvel there is anything left. I had arranged to do this trip with Mike and Sam, and we were all watchful of the weather forecasts and weather model information in the week leading up to July's full moon. The best weather looked like it would be on Sunday evening, but the storm passed through quicker than expected over Friday night, Saturday was a cracker of day. Sam and I hatched a very approximate plan over the telephone which optimistically featured the fastest times we had travelled over each section of the route. Oooopps. Not the best way to estimate time! At least walking straight through, without staying in any huts saved me from having to splash out on the recently increased price for a new annual hut pass. Flat battery number one: After seven weeks of being an incredibly fuel efficient Subaru - stationary on my driveway! The battery was dead and would not turn the motor over. Thankyou awesome neighbour Ken for helping me out so we could go tramping! I must say I do prefer to walk or to cycle, but must make sure I the car moves out of the driveway at least occasionally! I collected Mike and Sam enroute to Otaki Forks. Oooopps battery issue two: I had not replaced the batteries in my SPOT after removing them before flying back from the USA recently. Sorry - no digital breadcrumbs for the worrying family at home. No problem as long as we do not need that SOS button! Shortly after crossing the bridge over the Waiotauru River we saw Spencer, whom I had not seen for a couple of years. He reported ice on top; crampons recommended; couldn't get into Kime Hut as it is frozen over. We noted that regardless of the not so balmy conditions he had reported that he had travelled without an ice-axe. After a quick chat Spencer kindly drove my car back to Wellington to save me the effort of returning to Otaki Forks to collect it! A few minutes before reaching Field Hut darkness encroached as we travelled for our last few minutes in the bushline with the use of our headlamps. 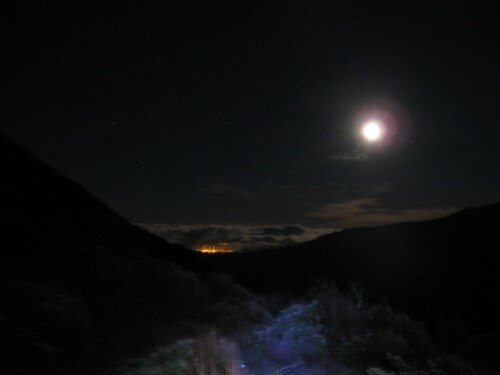 Once beyond Field Hut and above the bushline the moonlight provided enjoyable conditions under a beautiful night sky. With Mike on the trip and his knowledge of astronomy we were able to celestials the prominent celestial body in the sky to our west. All without needing to refer to Wikipedia to pretend to be smart. Now above the bushline we had Venus as a prominent celestial body to the west. The lack of snow was notable as we walked across Table Top. At this time it was difficult to co-relate with Spencer's crampons recommendation. There were a few patches of firm snow as we crossed Dennan followed by thin layers of snow leading to Kime Hut. There was substantially less snow than when I was here last year, however, on this occasion it was much nearer to frozen and a lot more slippery. Upon reaching Kime Hut the door was frozen shut, just as Spencer had warned. 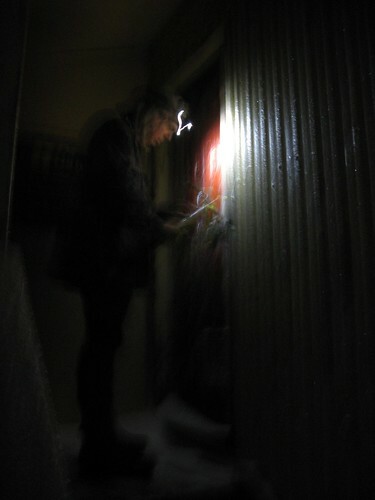 Sam used his ice-axe to remove the frozen ice from the large metal latch to gain entry. I was pleased to have thought ahead by carrying extra fluid with the Kime Hut water tank frozen solid, which was always going to be likely at this time of year. Departing Kime it was onward and over Field Peak (which counter-intuitively is nowhere near Field Hut of course). Once reaching the descent of Field Peak on it's southern side it was icy and slippery. Once again, just as Spencer had advised. My ice-axe has been on many more trips than it's been required in the past. Tonight it was essential to assist my rather less than assured footing on this mixture of ice and rock. 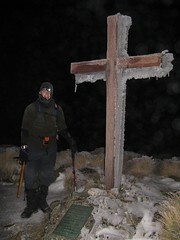 There was some cloud about when we reached the summit of Hector and the memorial cross, but not enough to block the light of the moon, or as Mike would prefer to correct me, the light of the sun reflecting from the moon. Once over Atkinson there was a lot less ice around as we continued around the Dress Circle and over Aston, now with Jupiter clearly visible to the south east. Once at the top of Alpha where there was no snow or ice at all. We spent a few moments relaxing on top of Alpha. Enjoying the night sky and the still air which is so rare in the Tararuas Range. We approached Alpha Hut quietly, but found it empty on this glorious evening. Without needing to worry about disturbing others, we had a reasonably long rest an a snack before departing a little after 4am. We were already a long way behind our intended, and optimistic time but only had the Marchant Ridge left between us and our destination at Kaitoke. However, I believe that the real reason ridge is so despised is because it is both long and at the end of epic journeys. The Marchant Ridge often being the final stretch of a Southern Crossing or an 'SK' and it is some 15km long. The mind says you are nearly there, but in reality you are not. The route from Alpha Hut to Kaitoke along the Marchant Ridge covers 40% of the total distance over the Southern Crossing route! On this occasion, I stepped in a hole somewhere near the 'top' of Marchant Ridge. After wincing and limping for a few strides, at which time I felt like rolling over the ground screaming like a girl, I just kept walking. The further we went the more my knee swelled. I was unsure if I had an injury, or if a less ambitious trip would have been more desirable after not having been out tramping for a while. I just kept on moving. The sun was rising by the time we reached the open area on Marchant that was created by a fire here some years ago. and eventually we found our way to Kaitoke over 21 hours after leaving the car in Otaki. This was a much slower trip than we had optimistically anticipated. That said the GPS data that Mike collected suggests we only spent about 13 hours actually moving - the rest of the time Mike and Sam must have been waiting for me? While they *did* spend a lot of time waiting for me, I’m not sure it was quite accurate! Thankfully about a week later the swelling in my knee came down and I can once again see my knee cap – phew!.